Record breaking jumping and surprised squirrels! With the good weather we've had recently we've been noticing 'cuckoo spit' starting to appear on many of the plants around the Basecamp grounds. I remember seeing this when growing up and always wondering what caused it, but never finding anyone who knew (although I probably didn't try that hard if I'm honest!). They don't really do much damage as they're so small and when adults they move freely from plant to plant, by jumping. It's this that makes them the record breakers - they are the animal kingdoms champion jumpers. They can jump up to 70cm, which when you're only around 6mm long is a fair distance. Even more impressive is that while a flea can do a similar jump the froghopper is around 60 times heavier, which gives a force per body weight comparison: A froghopper will manage around 400 times it's body weight, a flea about 135 times and a human being a measly 2 or 3. If you can't see the video here then click the link below to go see it onYou Tube. With the weather warming up nicely to coincide with the bank holiday and half term the whole area has been busy. 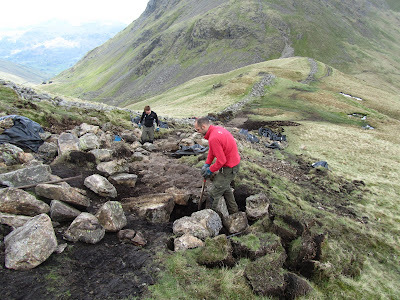 A couple of MOT trips to Wray Castle were made to put down gravel in the car park and along the side of the entry road to help curb soil erosion. Us new interns have been getting stuck into strimming, fencing and walling at various locations and are really enjoying it, great to be out and about as paperwork and admin erode the brain after a while! One of the fencing projects recently has been at Low Peel Near, with there being lots of bedrock no more than a few inches from the surface life has been hard trying to dig in the straining posts. With the driller finally deciding to work for a while we made some headway, the section next to the road is now done and dusted (much to the relief of everybody). The area that was fenced off near the shoreline has allowed a carpet of Bluebells to come through and some oak saplings are progressing well. 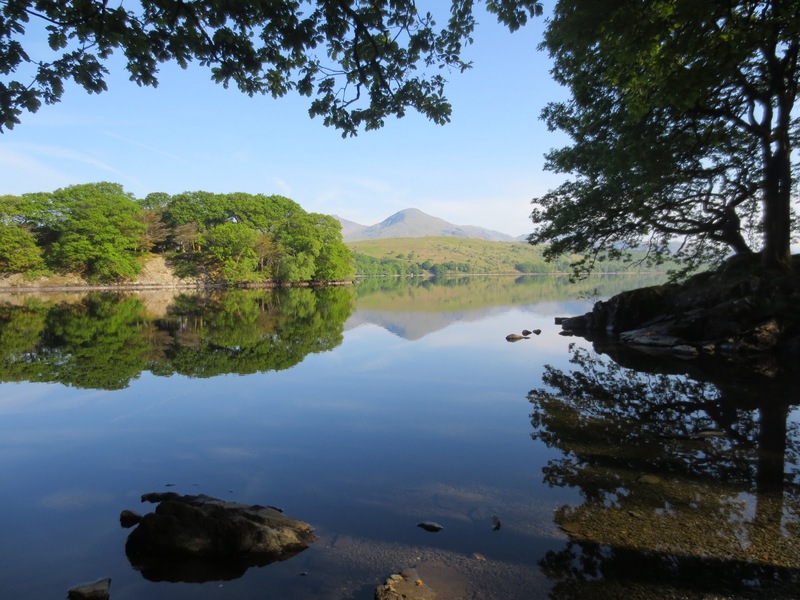 Love going out and exploring over the weekend and woke up early to do Helvellyn on Saturday morning. Weather was clear so there were some amazing views at the top. The one here is looking back over Striding Edge, next time I will do a longer loop, but the stomach was rumbling and I had an insufficient lunch of a banana and a cereal bar. A café was calling my name at the bottom. The path team have been working on Swirral Edge all week landscaping the footpath line to protect some rare alpine plants. This week it is the turn of the South Lakes Upland Rangers to do the blog. It may be helpful to first explain the title. "Pitching" refers to the stone step-like paths that are sometimes built in the fells to tackle erosion problems. 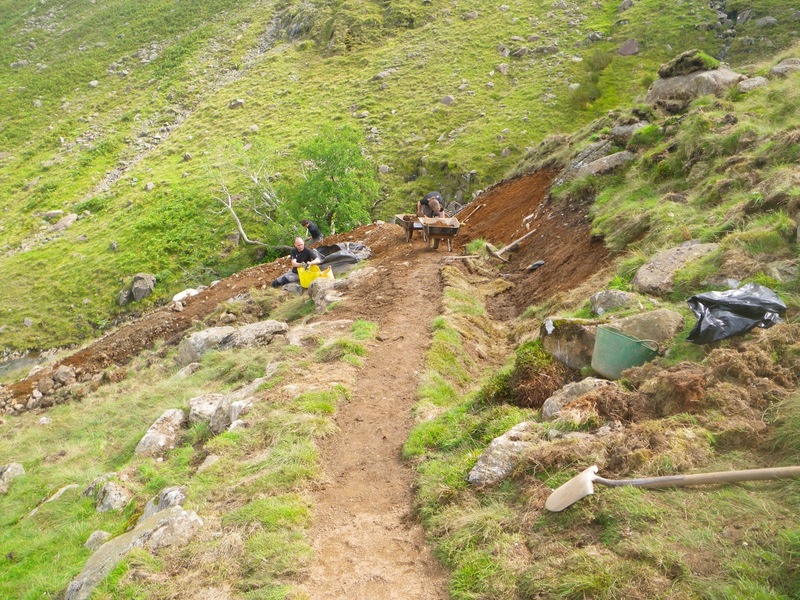 The "Itching" relates to the fact that in recent years the team have not done much path work using rock and we were keen to do some. In the last couple of years much of our work has used different techniques. These have included a subsoil technique, which uses compacted subsoil to create a hard wearing path surface, and landscaping techniques to define a sustainable path line and stabilise areas of erosion. These techniques predominately use materials near the path we are working on. 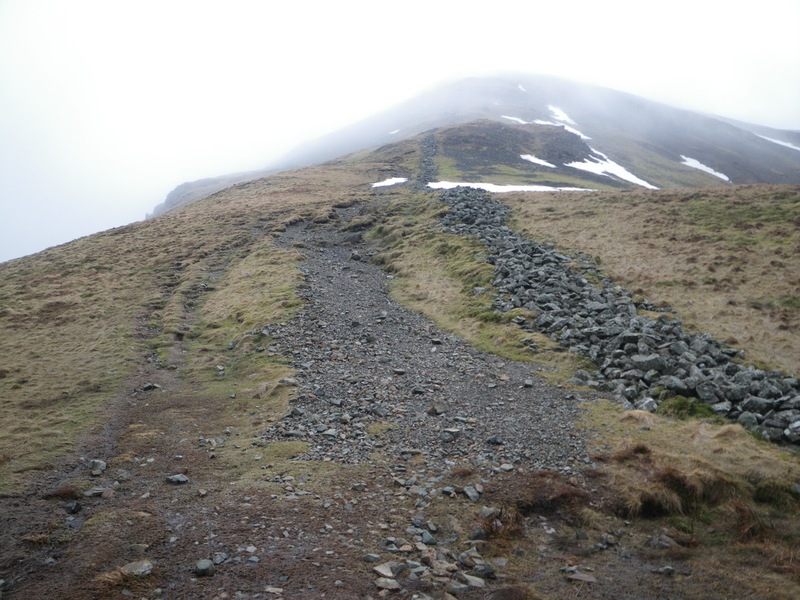 There are various issues when considering rock for a path project, such as the proximity of suitable rock (we use rock local to an area wherever possible) and can we use it. There may be rare flora growing on a scree slope that is potential rock source that should not be disturbed. There may also be significant costs moving the rock if done using a helicopter (see blogs earlier this year) or it may simply be that rock is not the most suitable option. 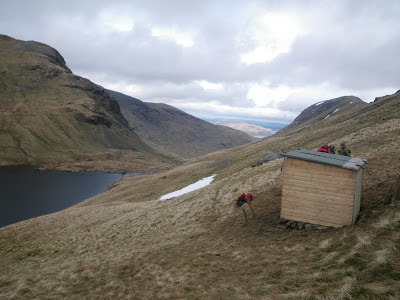 The team's main project this year is on a path from Grisedale Tarn up Fairfield. 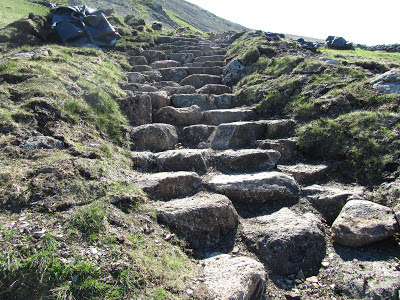 Survey work concluded that an erosion scar that is developing was best tackled by 100 metres of stone pitched path. This means that the team has lots of pitching to get their teeth into. In addition to getting rock flown by helicopter to the project site we were able to have a flat packed shed lifted there. This provides some storage but most importantly some shelter at lunch time when the weather is bad. The first job was to build & tether down the shed. Once the shed was up we started on the stone pitching, taking a 10 metre section each. The first step was to dig in some of the biggest rocks at the bottom of each section to act as anchor for the rocks going in above. 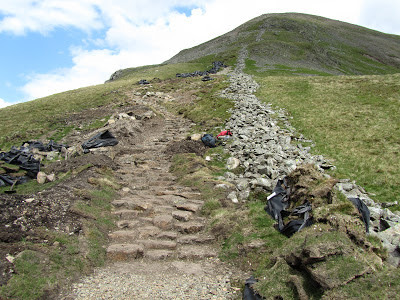 In addition to the stone work we also "landscape" out surrounding areas of erosion and finish off with turf and and grass seed to help the pathwork blend into the hillside. This project is progressing well and at the time of writing we are enjoying a very nice spell of weather. If you would like to know more about the daily work of the South Lakes Upland Ranger team they can be found on Twitter @NTLakesFells.